Well it's January and the sun is shining here, and it's also freezing cold! and the corners of my house are beginning to call me, to clean and tidy, and remember them. today was my day for going to the gym..... remember my list of things......and yes I still need to tell you more about that, but although I was going to the gym, I cleaned my craft room instead. Oh yes, much more fun! Not a deep, deep clean, but a shine and moving around of the the piles which have grown and need to find homes! I know to have a craft room is a luxury. For as long as I can remember I have carted around at least a small room full of creative and craft things..... I'm not quite sure how to apply my word for the year, CLEAR, to all of this. I guess the worktops are clear and that will have to do for now! This is the place where I can remember what lovely wools and materials I have, what I want to make, and have a read through my notes and inspiration boards. Of course a lot of crochet takes place on the couch, but this is the place where I use my sewing machine and cut and play with fabric. The plan is to spend more time doing this and less time in front of screen! I remember the first person I ever met who had a craft room. I was hugely inspired by this creative lady who made having a creative space an absolute priority. She simply had to make things, even in the midsts of a busy life. How amazing to have this space, I thought, an official space for creating, surely many things will happen!.... but you still need to find your way there, especially when other areas of your life are calling as well. Life has to happen too, I know. I will experiment to see how I can fit my creative life in in a more regular way. By the way, your room looks wonderful. I would like to help you to tidy this nice room. I craft in the mornings, when kids are at school and my hubby is at the office. When boys get back home is a little bit harder, then I do some "pinning"!!! sometimes I do still something in the evening, on the couch! I have a studio, that is my morning place, because of the good natural light! I love your room - it is so full of beautiful things! What a lovely room! Unfortunately Poppy Cottage doesn't have a room that isn't being used for at least one other purpose so my creative space is just spread around everywhere! Perhaps that's why I stick to crochet mainly, with the odd bit of knitting or hand sewing - nowhere to set up a sewing machine! So cosy cosy Heather,a lovely room. I am lucky to have a room to myself to create and craft in...but oh it gets very cluttered and I then find I can't be organised or calm in there! Great space and such sunny walls. I can't justify a craft space because I am am such a sparodic crafter. I instead I have bags of wool, fabric etc hanging from various door knobs around the house! I am beyond jealous - what a happy, colourful looking space. I would love a room of my own but all our rooms are spoken for. All my crafty things are scattered here and there throughout the house and it does do my head in. I'd love to have them all tidy and pretty in one room, like you do. I tend to craft in the evening when the kids are in bed - I rarely seem to have time throughout the day. This is a gorgeous creative space filled to the brim with cheerful colors!! I love it! I do have a creative space that I roughly call my studio. It's the formal dining room turned library/studio. I spend the majority of my free time there and since it adjoins to the living room I can be in there AND with the family at the same time. 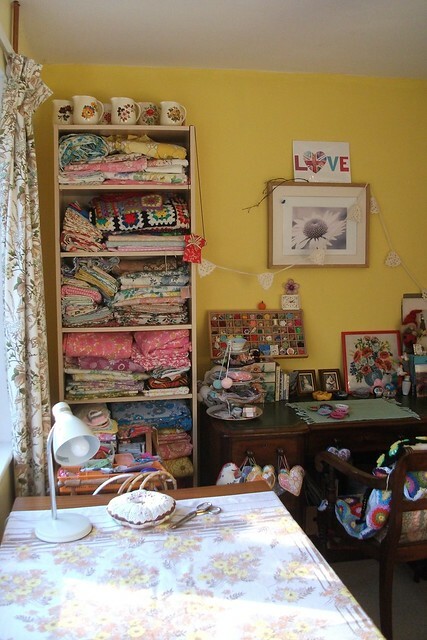 Your craft room looks lovely, I think I would enjoy rummaging through those fabrics! I know!!!! What a wonderful thing it is to have your own creative space. You can see pics of my room on my very first blog. Oh, I do soooooo LOVE my room, filled with everything I love!!!!!!!!! I really love your room too. So bright and cheerful. We are not, we fear, at all crafty, that is in the sense of making things, but have much enjoyed reading this very entertaining post having discovered you on the very lively 'The Custards'. Your fascinating blog is wonderfully eclectic and we have been enticed by your interesting profile. So, we are signing up as Followers and will look forward to more to come. I must remember what you have said - that you still need to find your way there - when my studio rises from the ashes of the storeroom. I do worry that once I have it I will not make sufficient use of it. Oooh - how lovely. There will be a lot of fabric envy going on I think! For years I used one end of the dining room table and a few of the chairs when things got out of hand! Loved having a peek at your crafty place and all the gorgeous things in it. What a better day than going to the gym, a place of punishment to my mind. I don't have an exact crafty place I'm spread all over the place, but my lot don't seem to mind. What a lovely craft room, Heather, it's sunny and pretty!! And such a better workout tidying up than at the gym ; -) I'm very lucky to have my own "make and do" room, but my girls have decided to have a room each of their own, so I'm on the move!! I do a lot of creating in my room, but also at the dining room table, and at night time watching re-runs of favourite shows! My craft room is the box room at home ... a tiny little space enough to get a desk in, a set of shelves bursting with wool, and a chair for me to sit at and craft! I am venturing into dressmaking too now and am seriously considering changing my guest room into a BIGger craft space with a table to stretch out those patterns! !